AnTyx: City of Seg-- wait, what? Let me tell you something. Tartu is not a big city. I was drinking at a friend's house on Monday night and took a cab home, then on Tuesday I walked from home to work, and then from work to the friend's house to pick up my car. This was not a hugely strenuous walk (and I live fairly far from downtown). 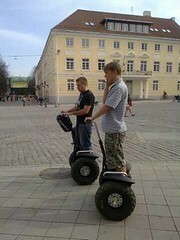 You almost never really need a car in Tartu; and you certainly never need a Segway. Nobody buys a Segway because they need one. The best part is that the guy is on the phone as well. Probably on the phone to NASA, this dude is a mover and shaker! But isn't having wheels for feet part of your future hitek fantasy? It's apparently a rental service, run by the snowboard shop in Raekoja plats. Giustino - not really. When I travel using wheels, I like to have hundreds of horsepower and a ton of metal protecting me.